To be honest, I am surprised Kyle waited 24 hours to tell the girls about her incident with LVP. Kyle’s not one to keep a matter private, that’s evident. 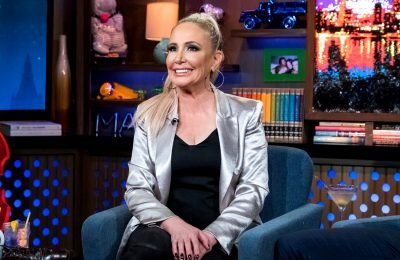 Just because all of the women assumed LVP was the mastermind behind the Radar Online story about Dorit, Kyle took it upon herself to find out the truth. Kyle cannot believe how angry and hostile Ken became when she basically called his wife a liar. She recounted a rather embellished story to the ladies and everyone is left dumbfounded. Too bad Kyle left out all of the parts where she was a troll. Kyle gets to meet her husband, Mauricio, for a date night. Why are they speaking Italian to the waiter, other than to simply show off to the viewers? Kyle shares that she still hasn’t spoken to LVP and she feels sad about it. Maybe she should have thought about that before ripping LVP to shreds the day before. Mauricio doesn’t like the way Ken spoke to Kyle and even Ken says to LVP, “I must admit, I was a bit strong.” Typical Kyle continues placing the blame on others. In this case, the friendship fallout is all LVP’s fault. 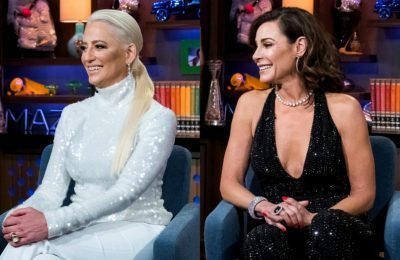 “SHE makes it hard to ever repair things.” LVP attempts to take the high road, as usual, but lets a little dig slip out about Kyle: “I’m not gonna stand here and say what a f*cking b*tch she was. Ha. I just said it.” Amazing. Oh for the love. Listening to Dorit talk about PK’s diabetes is enough to make me gauge my eyes out. Dorit attempts to act like the wife of the year and I am shocked that she is even able to wrap her pea brain around anything other than the story circulating about her abuse to dogs. Wait, there are other women on this show? I nearly forgot about Denise, Erika, and Rinna. In order to stay relevant, the girls get together for some aerial inversion yoga. WTF does that even mean? The girls fill Rinna in on the Kyle/LVP fight. Rinna acts surprised that LVP threw Kyle out of Villa Blanca and claims that this is a whole new level of drama. You can actually see Rinna salivating over the tea. Rinna decides that NOW would be the best time to get all the ladies together for some drinks as a celebration of sorts: Denise, newly married/Camille, soon-to-be-married. Maybe that’ll take everyone’s mind off of the recent drama. The newlyweds, Denise and Aaron, get talking about the LVP/Kyle situation. Aaron shares, “I feel really bad for Kyle.” Aaron should learn from the mistakes Kyle has made and just refrain from getting involved. Aaron has a premonition that LVP will call Denise soon and that when she does call, Denise should plan to continue being on friendly terms with the enemy. Hold on, is he a psychic? PK and Dorit always seem to match, don’t they? In case you forgot, PK is a type 2 diabetic. Loving how they are trying to get a new storyline brewing to keep the attention off of puppy gate. Not a chance. The Kemsley’s cannot understand why THEY are not invited to LVP’s upcoming birthday party and they are feeling a bit hurt…but interestingly enough, guess who DOES get the invite? Denise. Looks like LVP really was planning on calling Denise in the very near future. Maybe Aaron SHOULD be a fortune teller! Check out the jumpsuit twins, Teddi and Rinna. 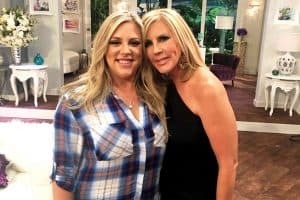 The duo talks about LVP’s birthday and how Rinna tweeted a post wishing her well. “It has become a running joke” that Rinna carries around pills, so the tweet had something to do with that….however, Rinna had no idea that LVP’s brother passed away due to an overdose. Rinna claims that she would never make a joke about that and tried to clear it up with LVP before the post was taken out of context. These ladies have zero sensitivity, huh? Back at drinks-with-the-ladies-who-didn’t-make-the -cut…Nice of Dorit to bring the twins out to play for the evening. Can she please tuck those bad boys away?! Camille makes her grand entrance and begins talking about her wedding planning. 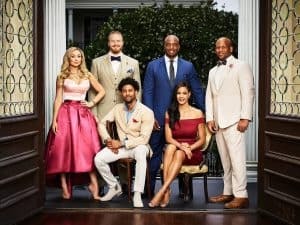 Camille states that all the girls are invited to attend the nuptials, which is ironic, considering that NONE of them were invited to an event that is occurring as they speak. I would have to say the women are all extremely jealous that somehow Denise, the one LVP has known for like 10 minutes, gets invited to the party, but they are not. Over at TomTom, Denise sticks out like a sore thumb waiting for the birthday girl’s arrival. LVP clearly forgot she promised to “grab a drink with Denise” before the big bash and that leaves Denise giving LVP a quick hello and goodbye. After a very short-lived jaunt at LVP’s birthday party, Denise joins the rest of the ladies for drinks. It doesn’t take long for Kyle to ask how LVP was. You know she is DYING of FOMO. None of the women understand why “everyone got cut off” from LVP’s party and Kyle pries to find out if LVP said “anything about anything.” Denise shrugs it off and pushes nosey remarks aside, leaving them to wonder what really happened at the birthday party. 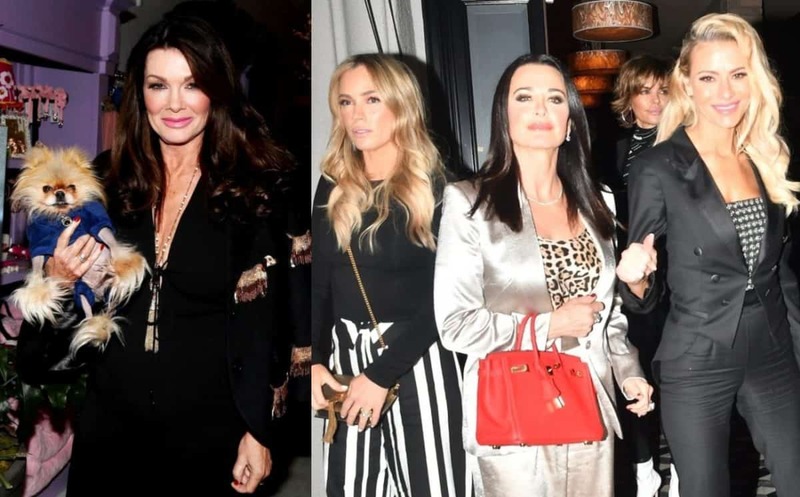 In the meantime, LVP schmoozes with her birthday guests and her children remind her that she can count on them as she goes through a rocky patch with her “friends.” It’s a sweet, rather rehearsed moment, but the intention was nice. LVP thanks everyone for coming and hopes that the next year will be better…considering she lost her brother and some friendships along the way. Someone gave Camille one too many glasses of wine because before we know it, we learn about her past as a dental hygienist and Camille goes a step too far when she giggles, “Before Lisa Vanderpump got her teeth redone…” she could barely look at her, making jokes about LVP’s gums. Camille has basically set herself up for a death sentence talking about LVP that way. She is out of control. The other women cackle as Camille shrieks about LVP’s teeth and I am left to wonder, is anyone going to be a good true “friend” to LVP and tell her about this incident?? TELL US – WHAT ARE YOUR THOUGHTS ON THE RHOBH EPISODE?